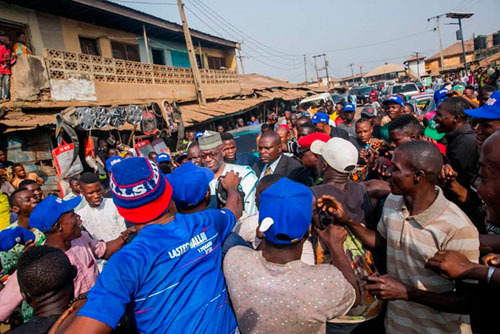 The Kwara State All Progressives Congress (APC) governorship candidate, Abdulrahman Abdulrazaq, at the weekend embarked on a door-to-door mobilisation of voters in Ilorin, the state capital. He pledged to ensure the peopleâ€™s welfare takes the front seat, if elected. Abdulrazaq had attended a programme organised by one of his support groups in Karatu Alanamu ward in Ilorin when he suddenly alighted from his vehicle and began a shop-to-shop mobilisation of voters on the street. â€œWe appeal to you to vote us and we will never disappoint you. We share your aspirations and frustration and we join you to say O To Ge (Enough is Enough),â€ he said as he exited an automobile kiosk in the sprawling Adabata area of the ancient town. Also, the Abdulrahman Abdulrazaq Governorship Campaign Organisation, has urged the Kwara State government to stop its purported bid to pull down the APC billboards. The organisation said the O To Ge movement had long been ingrained in the consciousness of the people of the state. It insisted that the billboards were erected after legal procedures had been followed and that the excuses by the government that they constituted environmental hazards were mere afterthoughts. â€œWe call attention to the fact that this is a state government under the control of Senator Bukola Saraki, who shouts â€˜democracy is under threatâ€™ each time he or his lackeys are called to account for their conducts. â€œThe only time democracy is being threatened is when his excesses are checked by law enforcement agencies! Democracy is safe and good when his goons go after opposition in Kwara or when he suspends fellow lawmakers who disagree with him,â€ Rafiu Ajakaye, the media aide to the governorship candidate, said in a statement on Saturday. Has it gone to that level?